People often ask how Copiosis accounts for personal moral and ideological views that inevitably influence human economic behavior. Some say the Copiosis model can’t work because it is impossible to objectively quantify human values. It is a basic tenet of free markets that they allow people to exercise their values, morals, and ideologies—including how those affect economic decisions—in a free and open way. How can Copiosis compete with that? Ideology influences economic behavior, and we acknowledge that in a Copiosis economy via the citizen jury, which is similar to a grand jury. Rather than determining if a trial should proceed, citizen juries—in behalf of the citizenry—determine how personal values are reflected in the net-benefit calculation. Using their diverse personal perspectives and some method of decision making (consensus, majority, plurality, etc.) jury members listen to expert testimony from researchers, statisticians, scientists, technicians, consumers, and producers with relevant information and experience. Jury members are selected, brought together, and oriented to their role. They listen to expert testimony, ask questions, and make their ruling, then pass the ruling to the payer organization, which codifies the ruling into the variables for the next period. Jury members will be randomly selected. The best way in my mind to do that is to use the unique identifier of each individual’s handheld device. Everyone in a Copiosis economy has a handheld. Using the handheld’s serial number as the selection record eliminates selection bias. It is a simple matter for an advanced computer to make the periodic random selections, notify the selectees, record their confirmation, monitor their participation, and reward them with NBR, all automatically. Core-team discussions can get bogged down talking about whether NBR calculations need to occur at various geographic scales—community, neighborhood, state, watershed or regional, national, continental, global. The same question applies to the citizen juries. The NBR formula will simultaneously operate at all these levels, and citizen juries can operate the same way, with one type of jury for each level and all juries operating recursively. A bible-belt community may have inputs to the formula that are based on personal perspectives different from those in San Francisco’s Tenderloin, much less in Cairo or Ouagadougou. With a capitalist mindset, one could easily think this would cause problems, and we sometimes fall into that trap in the core team. However, when analyzed more closely, such concerns fall by the wayside, because in Copiosis everyone gets a say, and no single person or group has a greater effect on a jury decisions than anyone else—common sense will tend to rule the day. Even if a group’s perspective and influence are minimized, lots of peaceful actions can lead to redress. Such is the beauty of the Copiosis design. Like the payer organization itself, anyone can be on a jury, but jury members are selected. It is not possible to volunteer for a jury, although it is possible to refuse your selection. We are all free to do as we wish in Copiosis. How long someone serves on a jury is an open matter at this point. What is important is how long the decisions juries make remain in force. It is important that jury service periods be tied to those periods, so that selection occurs with enough lead time to ensure juries are in place before the previous decisions expire. In addition to the jury process, there will be other decisions made that won’t require a formal civic process such as this one. We don’t want to be overwhelmed with running the system. We just want to have fun running our lives. Various payer-organization volunteers would make some decisions in the same way workers in biology, defense, agriculture, and other fields make their decisions today, but without the duress that comes with politics, money, and the fear of losing your job. Experts, producers, and consumers in those fields will work side-by-side keeping their small corner of the system running to the benefit of humanity and the planet. Of course conflicts will happen. We’re talking about human beings, right? I’m certain those conflicts will be resolved much easier once money, politics, government, and banks are eliminated. Then there’s the matter of competing interests forming teams to promote their agenda. Today we see dueling scientists on both sides of climate change, abortion, gun control, smoking, drug use; you name it, you can find scientists financially backed by rich people. Unless you’re making the mistake of seeing Copiosis through capitalist eyes, you can see how this situation can’t happen in our innovation. Competing interests tend to occur when there is a scarce supply of something, e.g., jobs, money, or power. Often these scarce items trigger intense personal fears—losing one’s ability to make a living and feed family members, fear of not finding love, fear of not meeting debt obligations. Nearly everyone on the planet today compromises several integrities to keep these fears. We compromise our personal integrity by covering up aspects of ourselves (such as sexual orientation) that could radically change our relationship status. We compromise our professional integrity to earn a paycheck. We compromise our values for the same reason, or to avoid ostracism from our groups. I have compromised in everyone of these areas. In Copiosis, you don’t have to earn a living, love is separated from money and power, and the better you align to your integrity the better you do in the world. Why work on science you believe is immoral, doctored, based on misleading data or just plain wrong when your job is not in jeopardy, you can’t even get into debt, and you don’t need money to get your basic necessities? With money out of the way, politics, the abuse of power, the need to be anything other than yourself, gradually goes away. Time becomes an ally, and sticking to your guns—remaining firmly in support of humanity and the planet—will prove to have been the right thing to do. The payer organization administers jury selection and the processes that make the jury work. Who specifically does this could be a single person, a panel, a committee, or whatever. They would all be passionate volunteers. One person can’t run the whole process without help, so the risk of this position becoming a bottleneck of power is low. Objective benefit to the consumer. 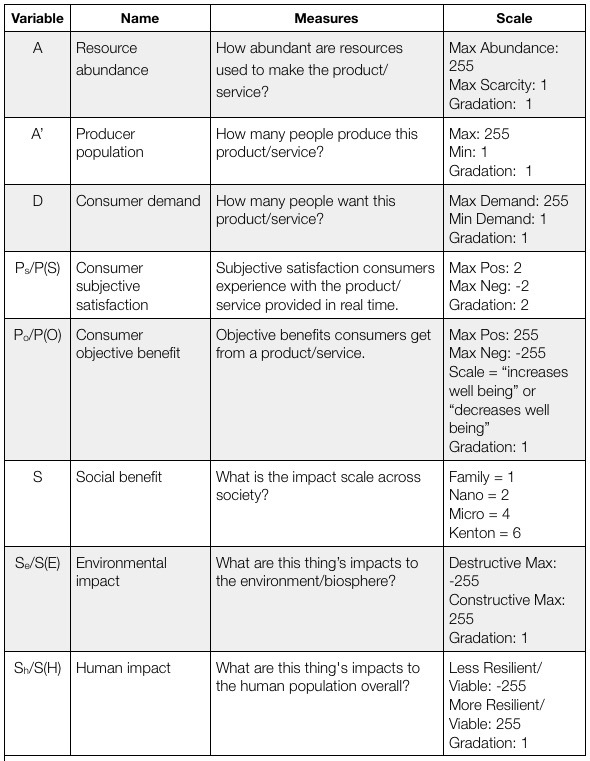 In most cases research and science can determine what value to assign this variable, however there will be times when more value-based determinations must be made. There may be competing interests on either side of how much objective benefit a massage has for example. Effect on the environment. Competing social and environmental interests may have to be reconciled on some acts and their effect on the ecosystem. Effect on humans Juries will debate the ideological perspectives on a given result and the value that result has in making humanity more or less resilient. I can’t predict what debates will occur, but I have had a peek. In my presentation in Chico, Calif., I mentioned that the subjective benefits of a massage often are greater than the objective benefits. I got some push back on that. Maybe the person disagreeing with me was a massage therapist. In any case, he and I had a disagreement. Others will too. I expect such decisions would fix the variables for a time or until new information becomes available or the situation on the ground has changed. A periodic cycle of jury selection, activity, and dismissal is a Copiosis operational mainstay. If situations warrant a dataset change before the period’s expiration, I’m sure some kind of accommodation can be created. Humans are smart. The citizenry, through our own activity and through the payer organization via the citizen juries, run the planet. There are no elected representatives staffing the payer organization, only people committed to the organization, society, and the planet. Nearly everyone who wants to have influence on the administration can, by volunteering to be a payer, by serving in the field, or by providing input from a professional perspective. Even if you have no perspective, but want to, it’s an easy matter to educate yourself. It costs only your time, since education is considered necessary and is provided to you at no cost. Citizen juries influence how producers are rewarded by providing ideological input into the net-benefit formula. However, there are many other inputs feeding the formula, so the juries’ influence is balanced with other information. That said, it is as serious a duty as serving on a jury today. 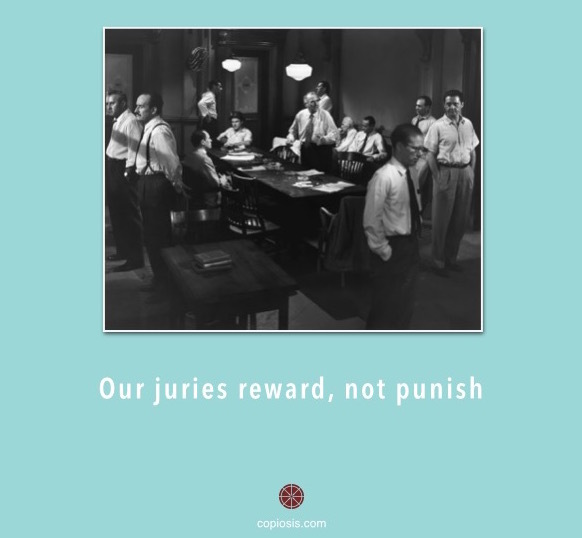 When I served on juries, people from all walks of life took very seriously the duty entrusted to them. How much more seriously might one take such a charge in Copiosis? Oh thanks so much for the encouragement. I’m not discouraged at all. We have so much going on in the real world, including our demonstration projects launching this year and our very successful software test that just concluded. All great stuff. Thanks for visiting! Artists of all kinds can potentially earn a lot of NBR doing what they love. First, imagine how artists’ lives will be transformed when all their necessities are provided to them at no cost, including their music education. What effect does that have on their ability to hone their craft? Second, since money no longer prevents exposure, there’s no reason why an artist can’t get her work consumed by those who love the work she produces. Understandably, an artist’s work will have to be pretty good because, when the whole world is running on Copiosis, there’s going to be a horde of “artists” unleashed 🙂 So consumers will have a plethora of options to choose from regarding “art” and will probably choose only that art which most resonates. My experience however tells me that so long as the art is good, there’s usually an audience for it. For example, Bobby McFerrin was once boo’d off stage in his early years. His artistic expression was so unusual, people thought it was a joke. Eventually however, people came to love his work. The rest is history! Personally, art isn’t art if it isn’t “commercially viable.” When I say “commercially viable” I mean: others consume it. Art after all is communication. If someone isn’t receiving the communication, it’s not art. So there will always be people who will consume a work of art IMO if the art communicates something. More importantly, though if someone really feels that making art is their calling, that means it’s their passion. If it’s their passion, that means they have the commitment to stay at it until their work communicates something, essentially becoming good and maybe even great. Most people who follow their passion at whatever, tend to become really good at what they’re doing. Passion is the secret ingredient to becoming successful…and rich, especially in Copiosis. People who follow their passion become virtuosos…so I have no worry that an artist – no matter what kind – so long as she is following her passion, will have an abundant life in Copiosis. Thank you for your thoughtful reply. When I was listening to the Interview on KBOO it occurred to me that many artists are already living very close to the Copiosis ideal; not using much money ; ) When I said commercially viable, I was thinking of poets or very edgy artists who are pushing the boundaries of art and don’t have a “product” to sell, yet they are provoking thought. I’m assuming inspiration and thought provocation would generate NBR …. Yes. Thought provoking art would. As would inspiring art. Recall that even artists can and would likely join the payer administration. They would be passionate about ensuring artists’ contributions are well rewarded for their creations. So yes, even “edgy” artists would do well. I am wondering how the NBR will be applied to Art, Music, Dance and Poetry. Most artists now work hard for little or no renumeration, doing a second job to pay the bills. Or they “sell out” and reproduce the same thing over and over to get money. How does that paradigm shift? What if a person never makes art that is commercially viable but still feels being a poet is their calling?